I’m generally looking for a particular sort of book when I browse through Net Galley’s Science Fiction/Fantasy offerings, and it’s not usually this. I’m a reader of romance novels in a guilty pleasure sort of capacity: the writing is generally acceptable, but sometimes I just want a happy ending—pun absolutely intended. But as a reader of books within the genre that I write, I stick with Fantasy, whether it’s High Fantasy, Urban Fantasy, Young Adult Fantasy or some other sub-genre. 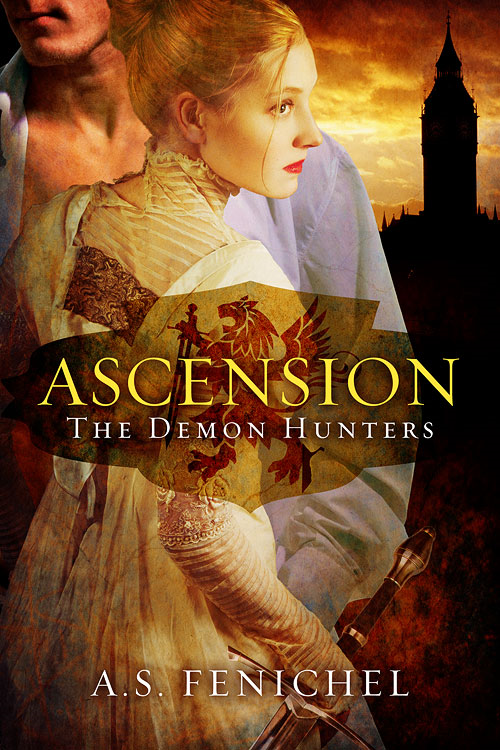 Ascension stood out to me because it was clearly a Romance in the Fantasy section, and I wanted to know what it was doing there. So I took a look at the summary. As it turns out, it’s a really interesting mix of Historical Romance and Urban Fantasy, although that urban setting is Regency London (and sometimes parts of Scotland). Lord Gabriel Thurston returns home from war to find his fiancee is not the sweet young girl he left behind. She s grown into a mysterious woman who guards her dark secrets well. When he sees her sneaking away from a ball, he s convinced it s for a lover s rendezvous. Following her to London s slums, Gabriel watches in horror as his fiancee ruthlessly slay a man. Lady Belinda Carlisle’s only concern was her dress for the next ball until demons nearly killed her and changed everything. A lady by day, and a demon hunter by night, she knows where her duty lies. Ending her betrothal is the best way to protect Gabriel from death by a demon s hand. The thing about this book is that it seems to inhabit two separate worlds; one is Regency England with all the baggage that comes with, and the other is a more modern world, where gender roles are less rigid. That the characters are aware of this juxtaposition is actually an interesting way of making use of that scheme, but in practice it can occasionally be jarring for the reader when jumping back and forth between those particular genres and their tropes. Belinda enjoys a status equal to the the male demon hunters in her order, and craves it in her mundane daily life—and yet confines herself to the gender roles that her society has laid out for her. And while an exploration of this, of how a woman might desire freedoms customarily given to men, would certainly be interesting, that’s not really was A.S. Fenichel is doing in this book. My one real complaint about this book is that the sentence structures run towards simplistic. “She did this. He did that. She did this other thing.” There isn’t a whole lot of variation and it gets noticeable when you’ve been reading the book for a long chunk of time. This isn’t necessarily a a negative thing about the book, as the straight forward sentence structures often help with clarity of meaning and most readers aren’t likely to notice this trend at all. It happens to be something I notice all the time, not because it bothers me, but because I tend to get bored and start mentally editing the sentences into a more pleasant and flowing structure. Over all this book was a fun ride, and the larger plot that it sets up will allow for future books to include some of the other characters we encountered—Serena and Mr. Douglass come immediately to mind as a likely pair. While I’m not sure that I would necessarily pick up those future books, I definitely enjoyed reading this one the same way I enjoy reading all romances: the heroine got her man and her happy ending. Ascension is written by A.S. Fenichel and is released today, October 7, 2014, by Lyrical Press. This entry was posted in Books and tagged A.S. Fenichel, book reviews, NetGalley ARC, Romance, Urban Fantasy. Bookmark the permalink.